Last week, one of the gals from my mommy group had a Bunco and raffle night to benefit Juvenile Diabetes. I made this card set for her to raffle off. I didn't end up going to the event, but I do know this got raffled off. I hope it brought in a couple dollars for the cause. I decided to CASE myself using this card HERE. 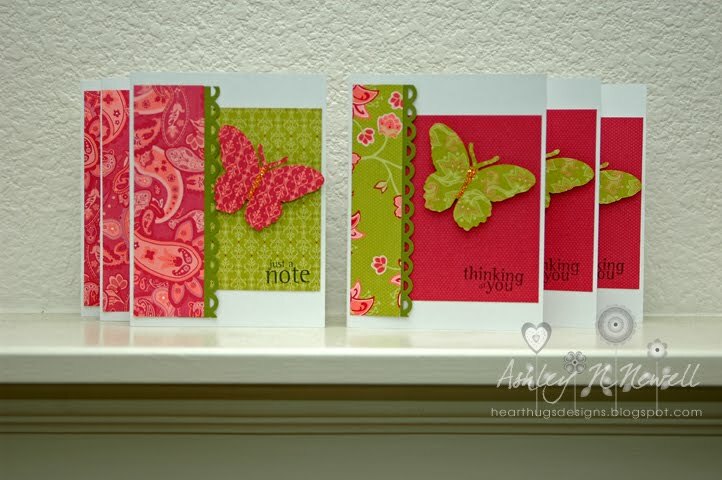 This set uses some old Stampin Up paper. The sentiments come from Ippity's Just Wanted to Say. The butterflies are die cut using my Cuttlebug, I added some Stickles to create their bodies. And the punch is Fiskars. OH MY--this is a super cute card! Love that you cased yourself;) LOL! I was thinking about doing that for the FWF43 challenge over at Unity! Such a pretty set of cards for a great cause! So cute! Fabulous colors and just love the style of the card and that butterfly.